Note: Sorghum is fresh in the fall, and often sells out by January or February of the following year. See the Purchase page the National Sweet Sorghum Producers and Processors Association has developed. Check out the list of Kentucky sorghum retailers and producers at the Kentucky Department of Agriculture website. 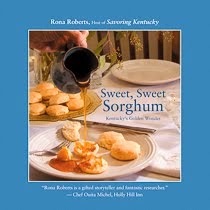 In Berea, look for sorghum at the Kentucky Artisan Center. In central Kentucky, pure sweet sorghum syrup is available at these locations, and many more: Critchfield's, Good Foods Market, the Kentucky Proud Market, and Windy Corner Market. In Jeffersonville, Townsend's Sorghum Mill sells online and at the mill right on Main Street. In Princeton, Kentucky, Nancy Newsom sells sorghum along with splendid country ham online and at Colonel Newsom's. In South Central Kentucky, Oberholtzer's Pure Sorghum is available during the season at the mill, 79 Sloan Fork Road, Liberty, Kentucky. In Stanford, Kentucky Soaps & Such offers sorghum along with a lot of other Kentucky edibles. In Versailles, Country Rock Sorghum is available at Woodford Seed and Southern States, as well as the Farmers' Market in season. In West Liberty, Holbrook Brothers Sorghum is available at the annual Sorghum Festival in late September, and at the West Liberty Veterinary Clinic. What a wonderful resource! Thanks for doing all this legwork for us. I am trying to find some wonderful sorghum molasses that was found in the kitchen of a house my daughter-in-law inherited. It came in a 1-quart can that looked like a paint can and I cannot remember the name of the farm that produced it. I brought it all the way back to Oregon when I came home and used the majority in a oatmeal molasses cookie recipe and on steamed baby carrots w/chopped pecans - mmmmm.... and when I moved to a new place and town, I forgot to take what was left with me. Does anyone recognize the description of the container? I'd sure like to see if they could ship me some more of it! Thank you! For all the sorghum loving folks, check out www.sweetgrassgranola.com - their granola is made with Kentucky sorghum and it's delicious!